For more than a decade, RBELL Medical, maker of The CleoPen, has been a driving force for innovation in the healthcare industry, particularly in the area of aesthetic medicine. Today, RBELL Medical has entered the practice of hair restoration, a field that’s not always delivered optimal results for patients. With The CleoPen aesthetic device from RBELL Medical, trained practitioners can stimulate follicle growth via a combination of proven methods. The Carolina Men’s Clinic and Nava Health & Vitality Center are two early adopters of this safe and effective complementary approach to hair restoration. “Hair restoration is one of the most in-demand treatments today,” says RBELL Medical CEO Rebecca Bell. “And it’s not exclusive to men, either. Women account for about 40% of hair loss cases in the U.S., according to the American Hair Loss Association. Unfortunately, women’s hair loss has been something of a taboo subject. My hope is that with better treatments made possible by The CleoPen, the silence around this topic can be broken. This combination of therapeutic approaches is what makes The CleoPen the perfect tool for practices that offer hair loss treatments. 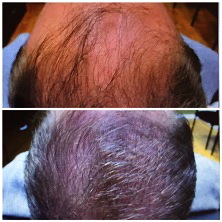 Among the most promising hair restoration treatments today is PRP. An increasing number of aesthetic medicine experts are seeing the value in PRP, a technique that began as an orthopedic and sports medicine treatment alternative. Numerous clinical trials have now shown that the technique can induce stem cells in the hair shaft to initiate a growing cycle. Moreover, PRP can encourage the development of the hair canal, control hair growth and follicle size, stimulate increased growth by prolonging the growth phase, and increase the diameter of hair shafts. Healthy growth is further supported by an increase in small blood vessels surrounding the follicles. An added benefit of PRP is that is can be coupled with any hair transplant procedure, helping partially transected follicles to grow vigorously in the donor area and support the conditions needed for long-term follicle health. Additionally, PRP will reduce the formation of scabs, trauma, inflammation and erythema (redness) in the donor area. Because the therapy relies largely on the body’s own restorative mechanisms (platelets), PRP encourages fast healing of the dermal and epidermal layers in and around the donor area. RBELL Medical is receiving requests from practices around the country that want to offer this innovative and non-invasive treatment to their patients. The Nava Health & Vitality Center and The Carolina Men’s Clinic are therefore only the beginning of a major shift in how hair restoration is done. RBELL Medical’s CleoPen allow for affordable procedures that are proven to work, with financing options designed to provide options to anyone interested in once more having a full, healthy head of natural hair. RBELL Medical combines the knowledge and insight of a consulting firm with the hands-on experience of a device manufacturer. The firm has assisted physician inventors turn novel concepts into practical instruments and treatments. At the same time, RBELL Medical helps market these new devices by partnering with medical practices that want to be at the forefront to innovative care. Our mission at RBELL Medical is to improve the care and outcomes of people by becoming the leading source of credible, quality resources. Our focus is to deliver superior service to our providers. CleoPen is a division of RBELL Medical. RBELL Medical is the parent company of RBELL Radiation, The Cleo Pen and RBELL Beauty. All RBELL Medical companies share the same ethos of compassionate care.